Progressive Charlestown: Does Monsanto's Roundup cause cancer? 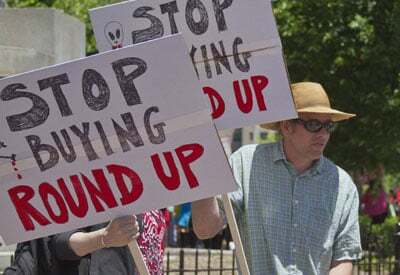 A federal jury in California has unanimously decided that the weedkiller Roundup was a “substantial factor” in causing the lymphoma of 70-year-old Edwin Hardeman, who had used Roundup on his property for many years. This is the second such verdict in less than eight months. In August 2018 another jury concluded that groundskeeper DeWayne Johnson developed cancer due to his exposure to Roundup, and ordered Monsanto, the manufacturer, to pay Johnson nearly US$300 million in damages. In product liability cases like these, plaintiffs must prove that the product was the “specific cause” of the harm done. The law sets a very high bar, which may be unrealistic for harms such as a diagnosis of cancer. Nonetheless, two juries have now ruled against Roundup. Monsanto’s lawyers insist that Roundup is safe and that the plaintiffs’ arguments in both cases were scientifically flawed. But jurors believed that they were shown enough evidence to meet the legal criteria for finding Roundup was the “specific cause” of cancer in both men. As a result of these high-profile trials, Los Angeles County has halted use of Roundup by all of its departments until clearer evidence is available about its potential health and environmental effects. Although “proof” has a similar primary meaning in science and law – a consensus of experts – how it is achieved is often quite different. Most importantly, in science there is no deadline for a discovery, whereas in law, timeliness is paramount. The conundrum is that a legal decision may be required for a potentially dangerous product on the market before the science has been settled. Proof is an elusive concept. Do we need proof that our glimpse of stripes in the jungle is a tiger before we run? Do we need proof that the jet engines are reliable before clearing a plane to take off for London with 300 passengers on board? Can proof ever be absolute, or is it inherently a statement of probabilities? Scientists use proof to advance our understanding of nature. Science assumes that there is an objective reality underlying all of nature, which we can eventually understand. Nature has no moral compass: It is neither good nor bad – it simply is. Scientists are human, so they experience joy or disappointment depending on the outcome of an experiment, but those emotions do not alter the truths of nature. In contrast, lawyers use proof to find justice for people. Law is built on the premise that there are widely accepted codes of human behavior, which should be rectified when they are violated. Ideally, justice under the law is a highly moral endeavor with fairness at its core. Scientists vigorously argue about whether an experiment proves a new detail in the vast tapestry of nature. Most scientists require that a new experimental finding is reproducible, statistically significant and plausible within the context of experiments that came before it. But often conventional wisdom, based on what had been proven in the past, is wrong. For example, until the 1980s medical wisdom said the cause of stomach ulcers was too much acid secretion. Therefore, young doctors learned in medical school to treat ulcers with antacids, milk and a bland diet. Then in 1983 a couple of troublemaking Australians named Robin Warren and Barry Marshall suggested that a bacterium actually caused ulcers. Of course, this was not believed to be possible because no bacterium could survive in the highly acidic environment of the stomach. Marshall and Warren were widely ridiculed after their article appeared, and heckled at conferences where they presented the idea. However, other scientists became interested and started to investigate the alternative theory. New evidence accumulated over the next decade and ultimately proved that Marshall and Warren were right. They received the Nobel Prize in Medicine in 2005. Today the bacterium, H. pylori, is believed not only to cause ulcers but also most stomach cancers worldwide. To reveal the facts of a legal dispute, lawyers engage in adversarial argument. Attorneys for each side argue from their client’s perspective, without claiming to be objective. In an ideal world, with diligent and honest attorneys on both sides, justice should prevail. Often, however, a case is not ideal. In some product liability lawsuits it can be perfectly clear that a faulty product, such as the rupture-prone Takata airbags that car manufacturers were forced to recall several years ago, caused a plaintiff’s injury. However, as I wrote in connection with the first Roundup lawsuit, this is close to impossible to prove in cancer cases. Product liability is the area of law in which consumers can bring claims against manufacturers and sellers for products that injure people. However, this finding does not mean that Roundup “probably” caused Johnson’s lymphoma. The European Food Safety Authority, an equally authoritative deliberative body, also assessed glyphosate, concluding that it was unlikely to pose a cancer risk and actual exposure levels did not represent a public health concern. This study considered much of the same evidence as the International Agency for Research on Cancer, but interpreted it differently. Nonetheless, the jury concluded that Roundup had caused Johnson’s cancer and awarded $289 million in damages, which was reduced to $80 million on appeal. Clearly, in their view, there was sufficient “proof” for the case against Roundup. In science, proof can only be defined as a consensus of experts who agree that the facts overwhelmingly support a specific conclusion. In law the jury plays that role, with jurors expected to become experts in the case. This means, of course, that what has been proven in science or in law can be unproven with new evidence or new experts. Many big questions in physics, geology and biology have taken centuries to answer, and scientists constantly re-evaluate those answers in light of new evidence. For example, in the 1930s physicists widely agreed that there were three fundamental particles: electrons, protons and neutrons. Today the standard model of physics holds that there are at least a dozen elementary particles, with many others hypothesized but not yet proven to exist. Legal judgments have much more immediate impacts – sometimes life or death. Justice delayed is justice denied, and jurors must agree on a final proof to deliver a verdict. But as history has painfully taught us, a rush to judgment can yield the opposite of equity. Glyphosate provides many benefits, which must be weighed against the potential for harm. Bayer, Monsanto’s parent company, faces potentially enormous liability from thousands of lawsuits claiming Roundup gave plaintiffs cancer. So, what is a juror in the next Roundup trial to do? As I have argued previously, “specific causation” for cancer can almost never be proved. However, that does not mean that a plaintiff has no case. If the formal standard in law were changed to “probability of causation” as used by the Centers for Disease Control for occupational cancers, then a jury could find a product guilty of substantially increasing the risk, and make an award for the plaintiff, potentially a large one. In my view, if this were the standard, future rulings like the two we have already seen would align law and science on this issue more closely.